Looking "where to sell my Bugatti Type 57?" Ask the Chicago Car Club! Are you wondering "where to sell my Bugatti Type 57 ?" The Chicago Car Club is interested in classic cars of all makes and models, especially a Bugatti Type 57. 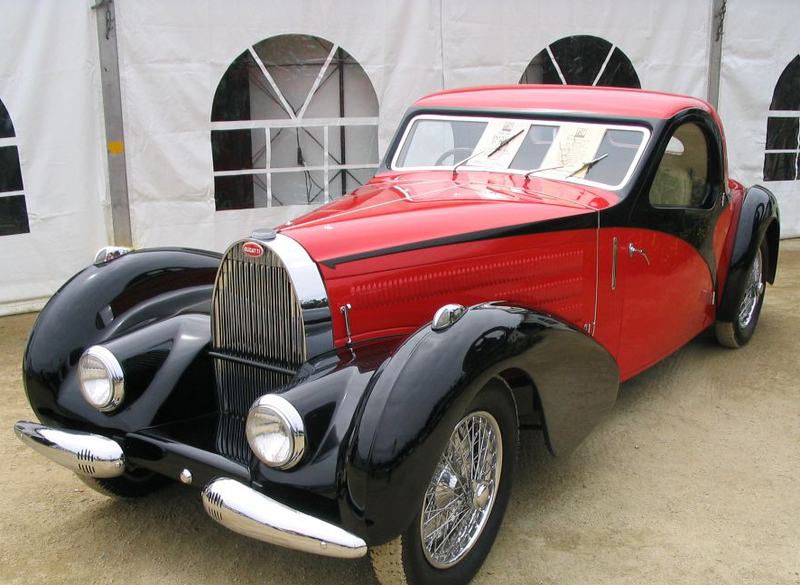 We make the process of selling your Bugatti Type 57 quick and painless. In just a matter of hours we will have your classic valued and, if you do so choose, turned into money in your pocket. All it takes is a phone call or electronic inquiry to get the ball rolling. The Type 57 was a touring car model produced from 1934 through 1940 by Bugatti in their factory in Molsheim, Alsace, France. It utilized the 3.3 L (3,257 cc/198 cu in) engine from the Bugatti Type 59 Grand Prix cars. The first Type 57 produced 135 hp (100 kW). Top speed was 153 kilometres per hour (95 mph). 630 examples were produced in all. The original production Type 57 stylistically features of previous models and had the Royale’s square-bottom horseshoe grille in a smaller size. Its engine was an Inline-8 positioned in a front longitudinal position. It used a Dual Throat Updraft Stromberg UUR-2 Carburettor and was outfitted with a supercharger. It used DOHC, 2 Valves per Cyl and had a displacement of 3257 cc/198.75 cu in. Its bore was 72 mm/2.83 in and stroke was 100 mm/3.94 in. The power output was 119.3 kw or 160 bhp. It used a steel and aluminum body over a steel frame. It had front and back hydraulic drum brakes. Its transmission was a 4-Speed Manual. Top speed was 152.9 kph/95 mph. There were several sub-models, such as the Type 57T Tourer. The Type 57T, meaning “tuned,” increased the performance of the basic Type 57. It was capable of reaching 185 kilometres per hour (115 mph). 96 Type 57C racing cars were built from 1937 through 1940. It used the 3.3 L engine as the road-going Type 57 output was increased to 160 hp (119 kW) by the use of a Roots-type supercharger. The Type 57C won Le Mans again in 1939. After the race, Jean Bugatti took the winning car for a test on the Molsheim-Strasbourg road. He swerved to avoid a drunken bicyclist. Bugatti crashed the car and died at age 30.